I’m a 36 year old Canadian human rights lawyer who discovered ultrarunning ten years ago and now my closet is filled with running shoes, rather than high heels! To steal from one of my favourite running novels, I run to ‘seek the void’ (see here). The last few years have been rather exciting… After completing a year in Afghanistan with the UN in 2013, I took a job in South Sudan in 2014 assisting people who were displaced by violence, which required me to live in a tent in very basic conditions. That same year, I started a charity called Free to Run, which supports women and girls in areas of conflict through running and outdoor adventure. I then worked for two years in Gaza for the UN Office of the High Commissioner for Human Rights. After a number of years working in conflict areas, I moved to Geneva to continue my human rights work from headquarters, where I managed to get myself into more trouble there than I ever had in Kabul, Juba or Gaza! After a life-threatening accident in the mountains on 1 January 2017, I went on to have my busiest race season ever, completing six mountain ultras throughout the year. Since March 2018, I’ve been based back in Afghanistan working for the UN and am keeping up with my training by running around an armed compound and pounding out the miles on the treadmill. Thanks for visiting my blog and I hope you’ll stick with me on my next adventure! Please don’t forget to check out Free to Run! I am so excited to have found your blog and added you to my Google Reader. Amazing…all I can say so far! Thanks, Shannon! Really glad you like the blog – your feedback is totally welcome… Happy reading! i didnt get your email address before we closed up, so drop me a line. we’re all good this end and just started looking for work again. Hey Alex! I just dropped by the Itchy Feet store in Bath to show them Orca’s merino and had a chat about you. Let me know what you’re looking for… Would love to help if I can! Hi recently discovered your blog, very inspirational how much zest for life you have. I read your fantastic interview in Running Fitness mag and loved your story-so-far. Glad to have found your blog now (somehow I missed the link on the first read of it). Hoping to “do” my first ultra next year. Hey Matt! How’s the ultra training going? Are you signed up for one this year or have you already completed one? Would love to hear an update! ARG, that is so frustrating! You must be so annoyed – I completely understand. But don’t worry… you’ll get it back!!! It is hard for me to say what it might be, BUT you might want to look up patellofemoral syndrome (PFS). It is also commonly called runner’s knee! I got PFS back in 2008 when I was training for Racing The Planet Vietnam. I was experiencing quite a bit of pain around my kneecap and it eventually got so bad I couldn’t run at all anymore. Like you, I was completely freaking out! PFS is basically when your kneecap doesn’t track properly so it starts to irritate the cartilage under the patella. For me, it was due to muscle imbalance issues (which is common in runners). The outside quad muscle (vastus lateralus) was strong than the inside one (vastus medialus or VMO) and so the kneecap was being pulled out of line. My IT bands were also super tight, which wasn’t helping the situation. I did go to physio for ultrasound and electric stim, but IF this is what you have you can also try a number of things at home. There are exercises that can strengthen the VMO such as one-legged quarter squats (only go down a little bit, not all the way). You can also try to loosen up the IT bands by getting a foam roller (let me know if you aren’t sure what I’m talking about). I also did a lot of deep water running. If you are near a pool, you can do either deep water running with a flotation belt on or shallow water running where your feet actually touch the ground if it doesn’t hurt too much. This will help keep the right ‘running’ muscles engaged during your recovery. Do some googling to see if your symptoms fit — but ultimately I would just pop in to see a physio if you can. You don’t want to misdiagnose and then lose potential recovery time. You’ve got time!! I’ll be thinking about you and hoping for a very speedy recovery. I know it is tough to think positively, but you’ll get there!! Will you keep me posted? Feel free to reach out anytime. I just wanted to say that I think your blog is awesome and I love that you are such a good runner but still have fun with it! Looking forward to hearing your updates – they are really inspirational! Hi Mike!! Thanks for following! Hey, and congrats on entering your first ultra – woot woot!!! The answer is yes, you are mental, but in great company 😀 Keep me posting on how your training is going. I would love to hear any suggestions for blog topics. Any burning questions as you get your feet wet in the ultra world? Thanks again! What was supposed to be a quick squizz at your blog has resulted in an hour’s reading: travelling with you, running with you, sharing in the pain, joy and happiness that oozes from your writings. Most of all the happiness. It is tangible. Thanks for sharing that with the rest of the world. Really enjoying your blog Stephanie. I met your folks last night at a Queen’s Alumni function and they mentioned your passion for running and world travel. You are an inspiration! Also – Happy Birthday! I was living in Vancouver the past 3 years and knew your brother Ben, which is how I got to your blog. Every time I look a little farther into the ultra world, the circles seem to get smaller and smaller – I hung out with your coach Ray for a little bit as he was running the West Coast Trail a few years ago. I’ve been following Jill Homer for awhile, who ran in Racing the Planet Nepal, and is signed up for UTMB as well… I just thought it was funny how many connections I made even on the first page of your blog. Anyways – it sounds like you are doing incredible things, both running and in Afghanistan. The blog is great to read as well. Keep up the good work. I stumbled across your blog after doing a search for female ultra runners and I have truly enjoyed your posts and videos. I am a beginner in the distance arena (only one marathon and at least fifty 5k races under my belt) but I am training for one half and two full marathons this year in prep for an ultra early next year. Your drive as a runner and the adventures you blog about are motivational. RaceTheWorld is in my future thanks to you! By the way, I’m a tad jealous that you are geographically closer to my husband than I am. I understand you are in Kabul, he is deployed west of Kandahar. Stay safe and thanks! Like your blog … running my first multi day in Nepal, Manaslu mountain foot race, in November ..then the Gobi March next June, was actually toying with the G2G after the Gobi which is how I came about your site so looking forward to your account of the race :-)..
Love your blog! I am a long distance runner myself– and I have been pondering trying out an ultramarathon for a few years now. I know I just need to sign up and do one and try it out instead of thinking about it any longer! I am also a freelance writer and I am interested in writing an article on your ultramarathon experiences thus far. If you’re interested in being interviewed via email for this article- I would love to hear from you. Hi Stacey! Happy holidays to you too 🙂 Thanks for getting in touch. I love that you are thinking about your first ultra… I may be biased, but I think you should just sign up for one and jump in! Happy to talk through any potential race ideas if you’d like! I would be happy to do an interview, thanks for asking. I just read about you in the Queen’s Alumni Review. I’m really interested in profiling you for Kingston Life magazine where I write a column on sports called Home Game. I have a special interest in both endurance sports (I’m a greybeard, soon to be 64, who cycled from Kingston to Newfoundland last summer) and human/rights and social justice (my book, A Year of Living Generously, concerns these subjects). And I’m especially interested in furthering the education of women who have been denied that right. I see you are back in New York some time in March? Or are you off to another race? It may be that we’ll have to conduct the interview via e-mail. Are you up for that? I just discovered your blog and have enjoyed catching up on your adventures. I am also a Queen’s alum and spent a few years in K-town. Currently I work in Kazakhstan and my wife and I will be visiting Kyrgyzstan in a couple of weeks. Having enjoyed your report I was then surprised to see not just a casual mention of Kyrgyzstan but that you’re actually living there – Kyrgyzstan is not a country you read much about. My (very) random link to the country is that I am the proud owner of the official (and only) Kyrgyzstan placard from the London Olympics opening ceremony. Since I got it my interest in the country has increased significantly, as well as my ability to spell it (having a 1m wide sign of it helps). My favourite Kyrgyzstan factoid is that it is further from the sea than any other country. I’m so glad my blog was able to help, even if just a little bit! How did your race go (and which race was it)? Let us know how you got on and what your next plans are! Hi Alex – I’ll send you an email. Cheers!! Hi! Are you still planning to support Racing the Planet even after what happened to Turia Pitt? It seems the only way to bring them to justice is to actually boycott their races. They have made an amazing amount of money and in the process completely destroyed someone’s life with no accountability. I couldn’t have a conscious to continue racing with them if I was you. Hi Nathan! You can reach me at stephanie.a.case@gmail.com or stephanie.case@yahoo.com. Thanks!! So my question is, was the sesamoidectomy worth it? Are things better with it or do you think you shouldn’t have done it? I am toying with getting it done myself.. I am an ultra-runner… Did 35 races in 2013 and 2014 was supposed to be even more! BUT… I am in a holding pattern because of the sesamoid problems for the last 6 months… I ran with the pain up to the point where I couldn’t do ultras anymore… Marathons are about as long as I can go without a lot of foot pain… I may just have the sesamoidectomy done but want to make sure if I do that it wont make things worse…. It’s a tough one for sure. I didn’t have a choice because we didn’t even know I had a problem with my sesamoid until the surgeon got in there… And once he saw what was going on, there weren’t really other options. I think in general the rule is to avoid a sesamoidectomy at all costs if you can. Try using padding to take pressure off the sesamoid (your podiatrist should be able to guide you!). Removing the sesamoid really changes your balance and the whole mechanics of the way you walk/run. I still have biomechanical issues for this reason and always will, but I’m happy to say the pain is so much better!! I’ve heard the opposite from others though. Shop around for a good surgeon if you do decide to do it… But get multiple opinions first 🙂 hope this helps and keep me posted! I love your blog! I am an avid runner myself, which is what led me to it, however, I am very interested in your human rights work. I graduated law school in 2010 and since then I’ve been practicing employment law in the U.S. However, I am interested in international human rights work. How did you get into this field? Any advice for someone who wants to break into it? Feel free to email me to continue the conversation. Wow! I have been spending some time on your blog lately and I just noticed the about page… I had no clue what a fulfilling life you’re living! I’ve never dreaded running myself, but I think I understand how climbing hooked you to adrenaline! Oh, I hope that one day I’ll have the opportunity to climb mountains like Kilimanjaro, it’s definitely near the top of my bucket list. It’s an amazing story how you got into running! Looking forward to read more about your adventures! I recently discovered your blog and I’m very interested in humanitarian fieldwork as a possible career. I know you’re very busy, but is it possible for you to tell me a little bit about your background education & work experience? How did you get where you are today? Do you have any tips for people looking to go into this type of work? Anything would be really helpful. Hi Sarah! That’s great that you want to enter the field… It isn’t easy – the money is poor and the conditions are difficult – but the rewards are priceless.You can read a bit more about my educational background here: http://stephcase.com/ or on my linkedin: http://www.linkedin.com/pub/stephanie-case/1a/96/542/. There are lots of avenues to this type of work, depending on what interests you. The key is getting real field experience through volunteering, internships etc. And not to give up 🙂 I’m still working on my career! Hope you’re having a great time in Mingkamman! I ended up on your blog randomly and got so inspired! My dream has always been to one day run the UTMB and I’ve started off my training towards an ultra trail with marathon running. Unfortunately after some stress fractures in the hips and knees I’ve had to put my training aside for a while, but after having read your post about UTMB I’ve decided that I’ll one day make it! That’s awesome! Definitely start working on races that will get you points to qualify for entry… UTMB is so popular these days that it often takes a number of tries to get in. Keep me posted! I can empathize with the stress fractures. I was riddled with stress fractures in my tibia, feet and pelvis (very painful!) the first two years of running. But I’m happy to say that my body seems to have toughened up (or I got smarter with training!). Knock on wood, right? 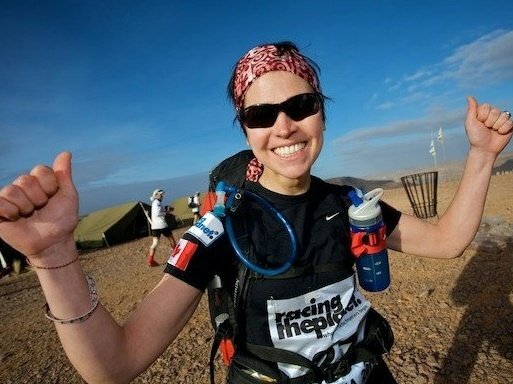 just found your blog when seeking information about the UTMB…congrats on the result! I wish the race would be longer so we would have a longer story to read as it is written perfectly 🙂 Thanks for sharing and looking forward to discovering new stories on your blog soon. Greetings from Slovenia! Hey! Are you planning on doing UTMB? Let me know if I can help! I’ve always wanted to go to Slovenia – looks gorgeous. Hello Ultra Runner Girl, I am an official follower! Had a blast in Zanzibar with you both and can’t wait to ready about your next adventures!! Hi! Love your blog. I am running the Inaugural MadAthlet 3 day stage race in NEw Hampshire. What vest do you recommend? I have just recently found your blog and I am so excited! I am 26 and an aspiring social justice lawyer/ultra runner. You’re proof my dreams are doable! Hi! I’m 26 year old Canadian woman about to start law school, tomorrow. In future I would like to do similar work to what you describe here in your blog. Do you have any advice, which courses to take, avenues to try? I appreciate any advice you can give me, thank you! Hi there! Good luck with law school -it’s a tough journey, but definitely worth it in the end. Where are you studying? Getting into human rights/international work is tough, but just take every opportunity you can get in law school to do pro bono, volunteer, and get exposed to international legal issues. Law of armed conflict, international human rights, even domestic charter classes are great. Depending on what kind of international work you want to do, it can really help to have a strong basis in domestic law! Hey! Found your blog because I was looking for ultra. I can’t have enough about running (except when the body says no, like now) and thinking about switching from marathon to ultratrails. I need nature again, and my dream would be to run UTMB. Maybe in 2018 – God, that’s long. I can’t wait to discover the rest of your blog. The “about” page makes me want to read more. So sad that we only have flat here in Berlin!